With Russia looking to invest in Indian infrastructure, nothing would be more useful than participation in the plan to clean India’s sacred river and open it for transport from Varanasi to Kolkata. Few journeys are as refreshing as a long cruise on a great river. Since many of the world’s greatest civilizations were built around river valleys, the land near their banks is rich and fertile and naturally beautiful. While going on cruises on the Volga and the Amur, two of Russia’s largest rivers, I always dreamt of taking a similar cruise on the Ganga or Brahmaputra. The two great rivers have been mentioned in the great Hindu epics, but have almost been destroyed over the last six centuries. One of Prime Minister Narendra Modi’s pre-election promises was to clean up the Ganga, and bring the river back to life. If this actually happens, the prime minister will have the admiration and gratitude of hundreds of millions of Indians, for whom the river is sacred. A special committee comprising of environmentalists, scientists, religious leaders and ministers have promised to prepare a plan to revive the river in the next 90 days. Unlike major projects of the past in India, there seems to be proper coordination between different ministries of the India government. The task force comprises of representatives from the environment, water resources, transport and shipping ministries, who are working with scientists from IIT Rourkee and Kanpur. Russia has experience in the field of connecting waterways and using them for transport. 1952 marked the opening of the Volga-Don shipping canal that connected the two great rivers and by extension the Caspian Sea and the Sea of Azov. Russian rivers are used as a cost-effective way of transporting goods in the warmer months. India’s rivers, however, could be navigable throughout the year, give or take the occasional monsoon storm. If the buzz from diplomatic circles is to be believed, Russia is looking to divert investment from Europe to India and is particularly interested in infrastructure projects. I’m sure that the Russian government has been doing its homework and knows about the issues that are closest to the heart of the Indian prime minister. While building up the strategic relationship, both countries are keen to step up trade and investment. 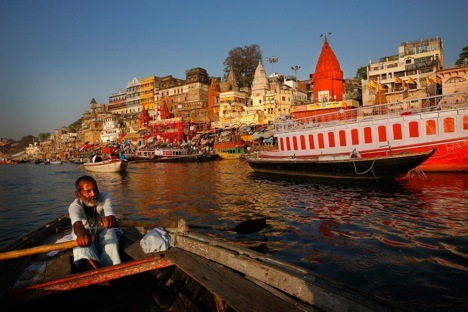 What could be a greater symbol of friendship than Russian investment in the Ganga restoration plan? Around 25 million passengers use inland waterways as a mode of transport in Russia. The number using a waterway from Varanasi to Kolkata could be up to three times higher. The benefits of such a waterway are obviously enormous for India. Good quality long-distance ferries on the Ganga would take a tremendous amount of pressure off the country’s busy and stressed railway system, both in terms of passengers and freight. The waterway would also ease the traffic off the highways. Besides the possible utilisation of Russian experts and consultants, there are other incentives for Russia to be involved in the project, which would provide a very good return on investment. Russian hydrofoils, one of the safest modes of transport on earth, would be of great use on some of the shorter to medium-distance routes, for example, Varanasi to Kanpur or Patna. Russian-made hydrofoils are used in Vietnam and are the preferred mode of transport for those heading south from Ho Chi Minh City to the coast. India could also propose Russian investment in the infrastructure of the north-eastern part of the country, which is gateway to the booming ASEAN region. The Brahmaputra, which flows into India from Tibet, has not been destroyed the way the Ganga has and using water transport on the river would be an easier task and at the same time a boost to the infrastructure of the region. India has already invited Russia to participate in the Delhi-Mumbai Industrial Corridor. With Moscow looking to invest and increase its presence in South and Southeast Asia, Greater Russian involvement should be in the eastern and north-eastern parts of India. These are the kinds of projects that would give a major boost to bilateral trade and economic cooperation. Russia’s connections with the Ganga and Varanasi go a long way back. Buddhist monks from Buryatia and other areas of Russia have been visiting the holy city from the 19th century, spending a significant amount of time in Sarnath, a town close to Varanasi, where the Buddha first taught the Dharma. Nicholas Roerich visited Varanasi, Rishikesh and Hardwar and one of his most famous paintings of the Indian plains is ‘Lights on the Ganges,’ which was completed in 1947, a few months before he died. The painting depicts an Indian woman placing a diya (oil lamp) on the Ganga at night. The painting is on display at the State Russian Museum in St Petersburg.